The Vietnam Association of Seafood Exporters and Producers (VASEP) forecasts that shrimp exports will reach 3.3 billion USD in 2016, up 12 percent from 2015. The sector saw a surge in the first month of this year, up 8 percent from the same period last year, according to VASEP. Shrimp prices also saw a slight increase of 5-20 percent in the Mekong Delta region due to low supplies. Statistics from the General Department of Vietnam Customs showed that shrimp exports to the US generated 657 million USD in 2015, up 38.3 percent from 2014, making the US the largest import market of Vietnam. 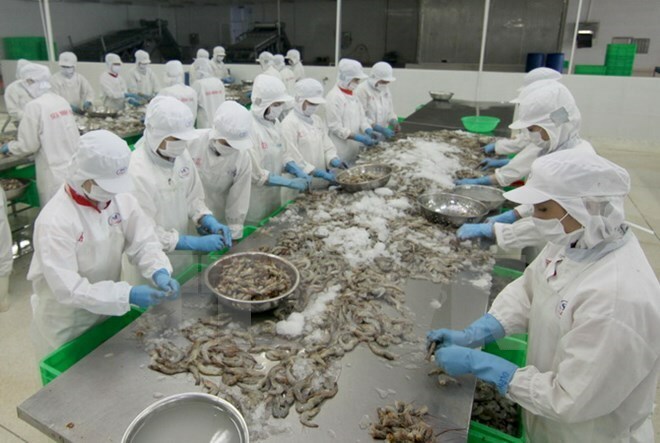 Vietnam’s shrimp exports to the US in 2016 will rise thanks to positive results from the ninth administrative review (POR9) for anti-dumping duties on Vietnamese frozen shrimp and the signing of the Trans-Pacific Partnership (TPP). The average anti-dumping tariff rate levied on most Vietnamese frozen shrimp sold in the US market plummeted from 6.37 percent in the POR8 to 0.91 percent, as regulated in POR9. This has eased the tax burden on Vietnamese shrimp exporters. In addition, the US’s growing demand for Vietnamese shrimp, spurred by the rising dollar, will increase shipments. Rising demand has also resulted in vibrant shrimp retail promotions in the US, creating opportunities for Vietnamese shrimp suppliers to boost exports to the country. In 2015, Vietnamese shrimp was sold in 92 markets, down from 150 markets the previous year. Key markets included the US, Japan, the EU, China, the Republic of Korea, Canada, Australia, ASEAN and Switzerland.